Do you have a little girl (or boy!) who loves to pretend and wants a magic wand? My girls started pretending everything was a magic wand after they started watching Super Why recently. And when I say everything, I mean anything that remotely resembled the shape of a wand. When they started pretending clothes hangers were wands, I knew that we had to make them some kind of wand. 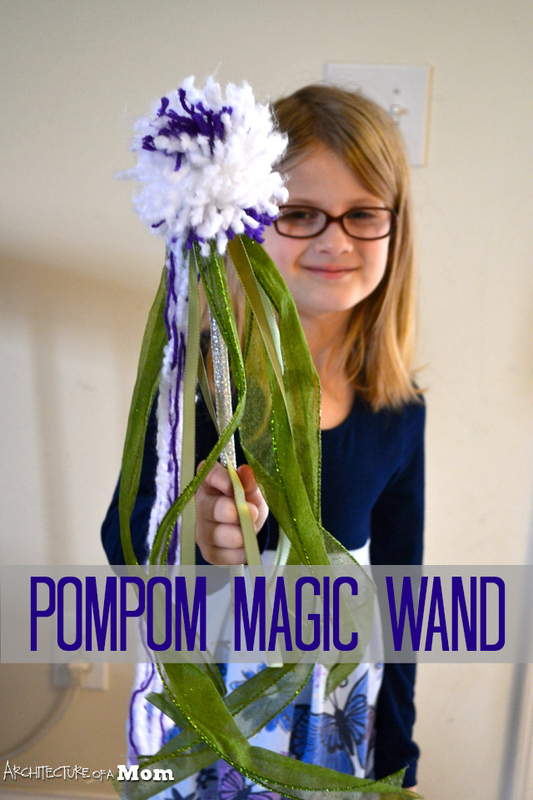 Luckily, I started cleaning out my office and so I had loads of scraps and pieces to inspire me to make pompom wands! This is a super easy craft. 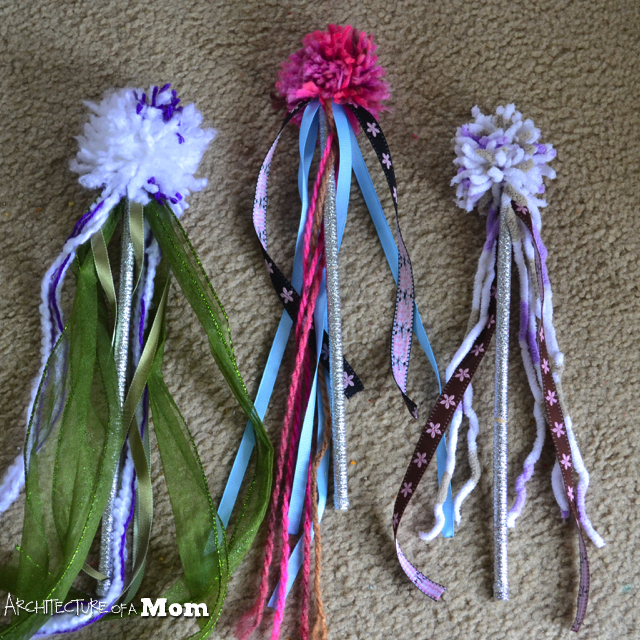 If you can use a hot glue gun, you can make this. Select a ribbon to cover your dowel. It can be any ribbon, but I suggest an opaque ribbon as opposed to a translucent ribbon. It will hide any variations in grain in your dowel better. Start by gluing the end of the ribbon to the end of your dowel, and then wrap it around the dowel in a spiral, making sure you cover every bit of the dowel. Trim the ribbon and glue it to the other end. 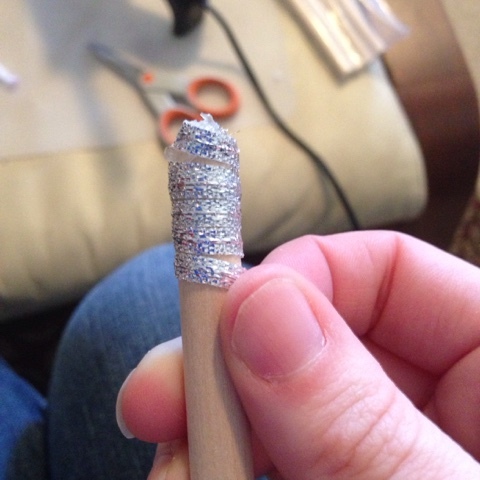 Take some other ribbon of various lengths and hot glue them to one end of the dowel. Repeat with some yarn if desired. 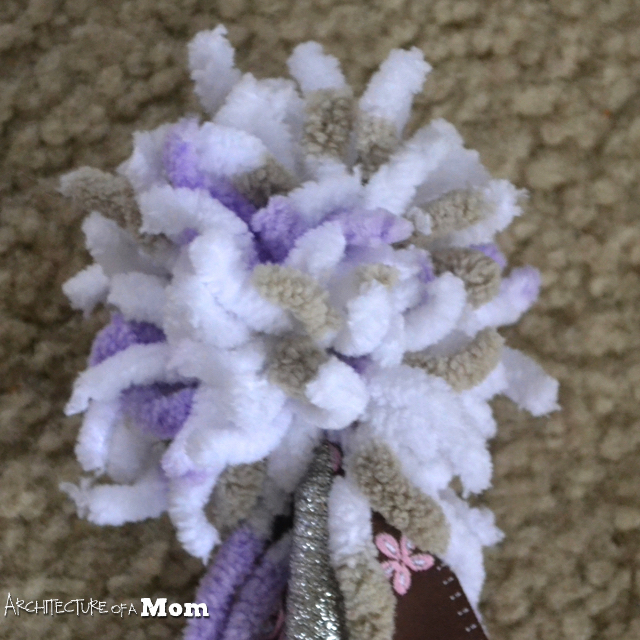 Use a pompom maker or your fingers to make pompoms out of yarn. (You can find many tutorials on YouTube). Hot glue it to the end of the dowel. Once it's all cool, hand it off to your child and watch the magic happen!